For several decades size and power were enough for an NBA center to not only see playing time but to dominate the game. Prior to the turn of the millennium, a dominant big man was a key part of the blueprint for building a championship team. During that era, the NBA was marked by all-time greats such as Shaquille O’Neal, Wilt Chamberlain, Bill Russell, and Hakeem Olajuwon among others. All of these names would come to be synonymous with the center position and all of them would lead their teams to multiple championships. Prior to the introduction of the three-point line in the 1979/1980 season, there wasn’t much reason to take shots far away from the basket and as such size and strength were enough to dominate the game. 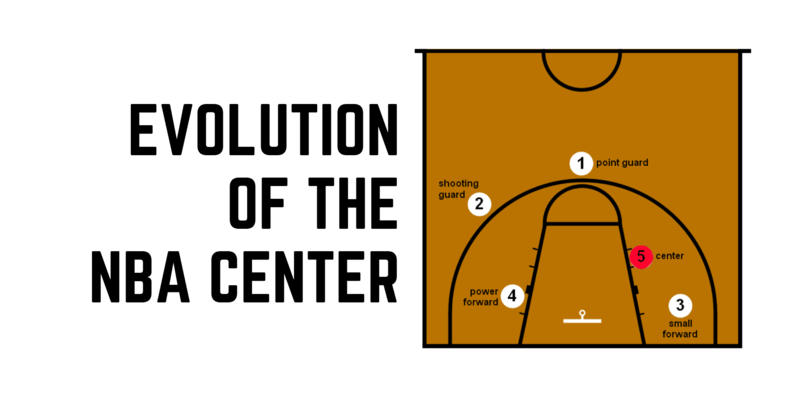 When the three-point line was introduced in 1979, however, NBA centers would have to evolve for the first time. Teams had to adjust to the three-point line and it would take 8 full seasons for them to start attempting at least 5 threes a game. As the teams were adjusting, the average pace (an estimate of the number possessions per 48 minutes) of the game was slowing. The average pace dropped from 106.13 during the ‘70s to 101.55 during the ‘80s and down to 93.86 during the ‘90s as the game was trending more and more towards isolations with the help of the illegal defense rule adjustments in the early ‘80s. A lack of threes and a slow pace were beneficial to centers around the league as many teams would run more and more low post isolations. However, teams were also learning their lessons and the talent pool was increasing so the old norms no longer applied. Size and strength were no longer enough on their own – low post footwork, rebounding and rim protection were the skills to master. The best centers of this era would go on to master all three (with some even adding the mid-range jump shot) and combine size, power and finesse to not only produce awe-inspiring moments on the court but lead their teams to win it all. Many consider the ‘80s and ‘90s to be the golden age of the center position but as they say, good times never last. The NBA in the 2000s would prove to be a very different beast compared to the past and the centers were hit hard by the changes the league was going through. In 2001 the illegal defense rule (a.k.a. defensive three-second violation) was eliminated which made it much easier for defenses to double team opposing centers down low. Most of the great centers of the ‘80s and ‘90s were either retired or way past their prime and new waves of young stars were taking over. These young players were trying to be like Michael Jordan or Reggie Miller a lot more than they were trying to be like Shaq, and the game would change yet again. The league was starting to utilize the three-point shot more and more, and once hand-checking was banned in 2004 the doors were fully open for guards and forwards to dominate the game. The league still saw some dominant centers during this time such as Shaq, Yao Ming, and Dwight Howard, but a dominant center alone was no longer enough for a title. Power forwards such as Garnett, Nowitzki and Pau Gasol were much better suited for the game at the time and centers were struggling to keep up. These developments led many contemporary centers to specialize in either rebounding, rim protection, pick&roll finishing or some combination of those. For the time being it was possible to earn both playing time and contracts this way, but the position was slowly losing relevance up to the point where the NBA removed the position from the All-Star voting ballots in 2012. The 2012/2013 season was the first one in which teams attempted more than 20 threes a game on average and the usage of analytics was propelling the three-point revolution around the league. This meant even more spacing, more switching on the perimeter on defense and even less low post touches. Even rebounding or rim protection specialists were being pushed out of the NBA unless they could start either switching on smaller players on the perimeter or contributing to the spacing on offense, preferably both. For those who couldn’t adapt to the shifting meta of the NBA, there was no longer a place in the league. But those who were able to adapt have contributed to the greatest evolution of the center position in the history of the game. The modern NBA center is a mix of skill, size, and power, unlike anything we have seen before. Thanks to being able to see what the game requires, the skillsets of centers who have entered the league within the last 5 years are more diverse and effective than ever. Joel Embiid can dominate the offense both down low and space the floor while being an elite defender and Nikola Jokić is a point guard in a center’s body, just to name a few. Equally impressive is the way how some veteran centers have expanded their game to fit the modern NBA. Demarcus Cousins added not only a reliable three-point shot to his game, but also an impressive ability to put the ball on the floor and drive down the lane, and Brook Lopez became a three-point marksman and an integral part of Milwaukee’s offense. Just a few short years ago the center position was almost extinct in the NBA and yet today it is undergoing a renaissance as great centers are once again among the key players on many title contenders. When almost everyone was discounting them, the NBA’s centers responded in the best way possible and what they’re now able to bring to the table is great for both the fans and for the game of basketball. With the rise of this new breed of players, and with a continued influx of both US and international talent one thing is for certain, the center position is back, and it’s here to stay.